We are very proud of what we accomplished during WWII when many parts of the Auto Industry were converted in a matter of days, weeks, months to become producers of motorized vehicles, guns, cannons, ammunition, to be used by our Armed Forces joining into the fight against the Germans. So my thought was: What if we could start a very large project, that involved local workers (not able to “outsource it”), use of US Technology ( think of Silicon Valley, from Intel, Microsoft, Cisco, MIT, CalTech, Boulder Tech Start ups…), our just acquired Auto Manufacturers (GM and Chrysler), extensive experience in how to create large scale transportation systems ( Boeing, Aerospace industry), Renewable Energy that takes us out of OIL dependency and at the same time put ecology in a first plane of our agenda (all forms of Clean Energy using Wind Farms, Sun Panels, etc.) ? 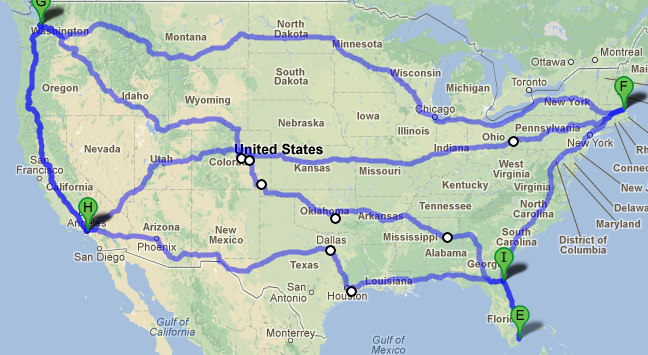 Could we take all this and at the same time create the future mass transportation ? Let’s define what am I talking about. Wikipedia defines High-speed rail as a type of passenger rail transport that operates significantly faster than traditional rail traffic. As of 2012 the maximum commercial speed was about 300 km/h (185 mph) for the majority of installed systems (China, Germany, Italy, Japan, South Korea, Taiwan, UK), 310 km/h (195 mph) in Spain and 320 km/h (200 mph) in France. The Shanghai Maglev Train reaches 431 km/h (268 mph). And all these came back to me as I listen to the news that the world’s longest line opened in China on 25 December 2012. 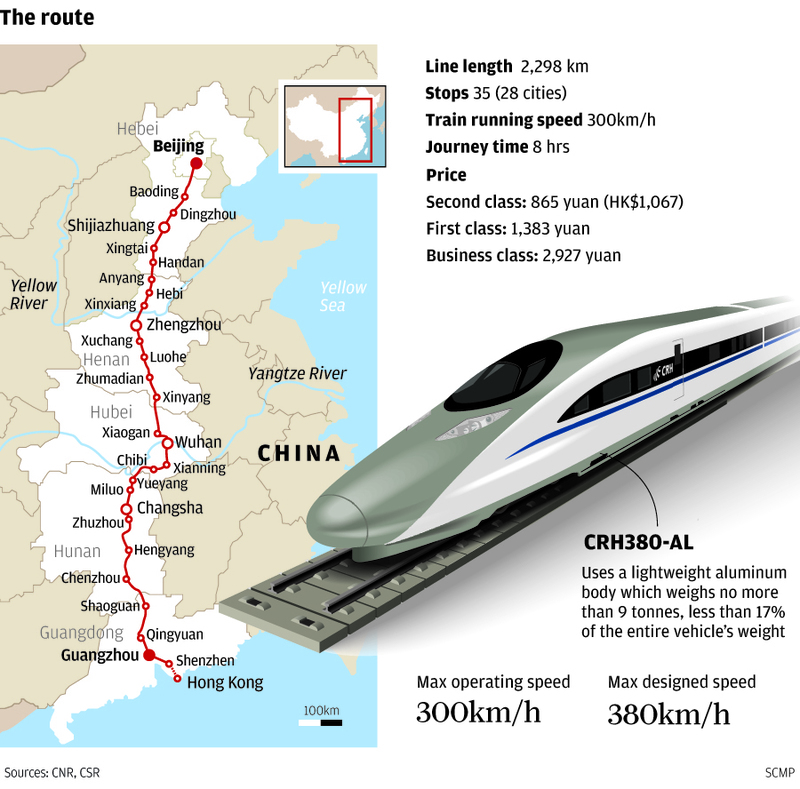 It runs 2,298 kilometers (1,428 miles) from the country’s capital in the north to Guangzhou. It required less than a year in planning and 3 years to build. It also come clear that they thought that this investment will bring much needed “economic stimulus” outside the largest cities where Public Infrastructure can be deployed faster and then creates migration of large numbers of population to those already overcrowded cities. Let’s see how I arrived to this. 1./ Build two lines simultaneously, one from Boston, MA to Los Angeles, CA and another from Seattle, WA to Jacksonville, FL. Create 120 different points where the construction starts simultaneously. 2./ The estimated cost per mile considering construction and all the necessary technology that goes into it es $2.5Million dollars per mile, so the total cost for the construction for 9 thousand miles, a great way to spend $22.5B instead of just giving tax rebates, help financial institutions, save insurance companies, etc. 3./ This will create direct jobs, just in construction at a very local level, for 190,000 people for 2 full years with average annual salary of $50-$60k (well above National average and double the local average in many of the 120 starting points for construction. 4./ It will create at least 3 extra jobs per direct position created, that means at least another 600,000 jobs related just to the construction. 5./ It will create also a several billion dollar splash into the software, electromechanical controls, computer and general IT industry. Plus it will create a totally new industry around transportation, communications, just to keep the trains running and all the security and controls that will be needed. Estimate this will create at least 10 to 15k very well paid jobs, coders, programmers, systems engineers, designers, etc. 6./ Of course, a BIG push was to happen to the Auto makers, one of them, will convert all or most of their facilities into manufacturing the cars, luxury cars, economy cars, Dinner cars, etc. that will be needed to expand the service. Parts and of course with time new designed vehicles, maybe even freight attachments, etc. This by itself would have saved more than 200k jobs in the Auto industry and created another similar number in the secondary industries, ie textiles, special parts, plastic injection moulding, etc. 7./ Engines design. The best part of this is that companies like GE, Boeing, could design and create the perfect engine for exceeding the current performance of French, Chinese, Japanese or Russian fast train engines. This could create a full new industry, with very well paid jobs, and of course the secondary industries. Estimated more than 20k jobs, all at high level pay. 8./ Energy supply. This is where a fundamental change will be made with this plan. The Fast trains have a need for a lot of energy, electricity at high level. By doing this “Fast Train” prpject, we will give a push into creating the largest grid of “clean energy projects” with their first permanent client. Then the economic impulse to each location will bring more revenue to those projects. 9./ RealEstate. Not all land in this plan is owned by Government (local, State or Federal) so it will mean that there will have to buy land in different points, that money will go into those local economies in most cases and it will also create opportunities for local developers to bring more people to won second homes, vacation homes, since it will be easy to get far away just for the weekend. People with resources that live in small apartments in big cities, suddenly could have a way to escape for the weekend (buy monthly passes? when no business people is riding the train it could be a way to keep it going at full capacity). If we can bring technology even more advanced to the actual fast speed train systems in the world, better design, and we get all the government levels agreeing to make this happen, we could build new tracks for fast trains between Boston and Los Angeles (Route 1) ; between Seattle and Miami. We could promote the use of renewable energy along the tracks and we could have used General Motors to transform themselves into a large manufacturer of “electric transportation systems” from the engines, to passenger cars. We also have Boeing and other very smart companies designing aerospace, less frictional models for planes, cars, etc. We have intelligence, resources, at that moment in time, the President had the ability to bring economic development to a large part of the country by starting a totally new way of transportation for Americans : Fast Speed Trains. And I meant real fast : The current fastest Train in the US, operated by Amtrak goes at an astonishing speed of 95 MPH for about 25 minutes between Boston and New York City, but the total trip takes 4 hours to do the 220 miles between those two cities, distance that in many other countries in the world already takes less than 45 mins to an hour by Fast Speed train. Plus today’s cost of the Acela Train between NY and Boston or NY and Washington DC is already very high, so keeping that price or even a price near a plane ticket will make this a profitable project in the near future. As you can see, this was just a thought back then, four years ago. Not all numbers are calculated with a much needed deeper research, but wouldnt it be great to see our Politicians thinking this way ? We could build this with a “Made in America” focus. Then I read that China got it figured out. We are again left behind. We need to get out of the box, executing the same old policies, expecting different results every time is just a sign of how insane are our Policies (and our politicians).